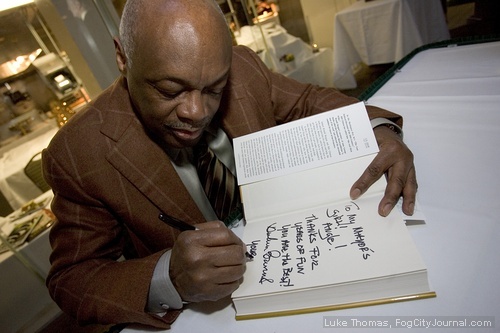 Former San Francisco Mayor Willie Brown signs a copy of his latest book, Basic Brown. Perhaps Churchill said it best: “History will be kind to me for I intend to write it”. While that may not have been his goal, former Mayor Willie Brown, Jr. did capture his rollicking political life in his recent book Basic Brown. Partly history, partly memoir, partly entertainment, Basic Brown recounts Willie’s 1951 arrival in San Francisco as a teenager, his ascendancy to California Speaker of the House, and his time as mayor of San Francisco. I had the chance to visit with Mayor Brown recently and find out just what he was thinking. el Greco: Did Churchill’s statement creep into your mind, just a little bit? Didn’t you want to shape how San Francisco and California will remember you in years to come? eG: You’re perhaps the last of a breed; the colorful, bigger-than-life, charismatic political leader making deals and downing cocktails like a champ. The current political spectrum both here in San Francisco and Sacramento has no one like you. Who is going to follow in your footsteps, or did the mold get broken after you were made? eG: What about the current crop of presidential candidates? Hillary, Obama, McCain? eG: Homelessness was one of the great albatrosses around the neck of your administration as mayor. Current mayor, Gavin Newsom, has found it a struggle as well, to say the least. Is there any hope, in your opinion, that San Francisco will ever get its arms around the problems of homelessness? eG: What about the “sacred cartel”, as you refer to them, of nonprofit developers? Will it ever be broken up? eG: You are the undisputed king of sartorial arts in this town. Just one question; where did all those Nehru jackets and bell-bottoms and peace medallions end up at? Did you keep some for display in a future Willie Brown Library? eG: The San Francisco Board of Supervisors is a mess according to many people in town. Supervisor Daly, among others, was a thorn in your side while you were mayor. Can the City continue with Supervisors who are little more than tinhorn dictators? Or will district elections be changed and our BOS become a broader minded body? eG: Supervisors apologized to you? Even Chris Daly? eG: Your book mentions that you often enjoyed the company of beautiful and intriguing women. Some have even referred to you as a “babe-meister” and to some of us, you’re an inspiration. How do you do it? What’s your secret? eG: That’s more than most of us can say. (more laughter). So how about the 49ers? Would you care to speculate? Will we manage to keep them in San Francisco? eG: Where does Willie Brown go from here? What’s the next step? el Greco, bon vivant and ne’er do well, is a hack writer living in San Francisco. He enjoys long walks through deserted alleys, chain smoking, drinking friends’ whiskey, and has yet to be discovered by the female population of the City. Comments for Basic Brown: How The Game Was Played are now closed.